With the Watson Language Translation service in Bluemix you can translate from and to English, French, Portuguese, Arabic, Spanish and Egyptian. To optimize the translations you can customize the service for your own domains. Below is a simple example. Let’s say you want to translate news about your products. You can use the out of the box translation capabilities based on the pre-defined news corpus for most text. However for your product names you often need to customize the service to teach it with the right translations or don’t translate product names at all. 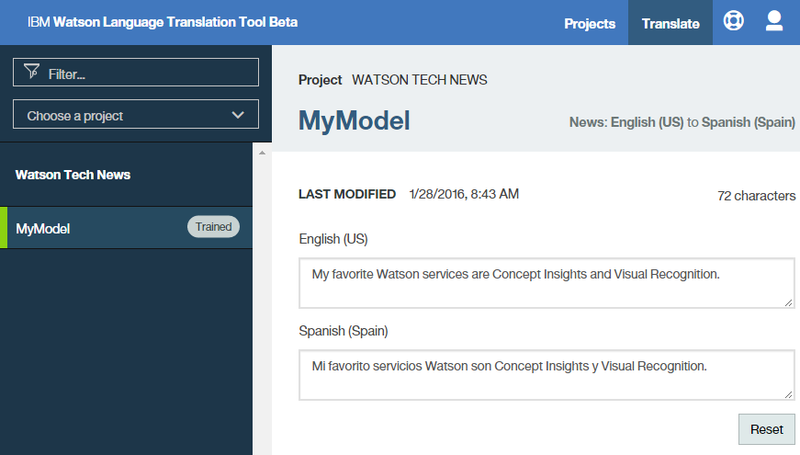 For example according to the Bluemix catalog the Watson service names “Concept Insights” and “Visual Recognition” are not translated in Spanish. To improve this you can create a simple glossary file and train the Watson service. As a result the Watson service provides now a better translation (or in this case doesn’t translate the names at all). To find out more read the documentation and the article “Customization and languages expand in Watson Language Translation” or watch the video “Getting started: IBM Watson Language Translation customization“. The Watson translation service is also used by the Globalization Pipeline service so that you can globalize your Bluemix Applications without recompiling them.